I made a set of gradients for Affinity Designer. I originally created the set to be used at work (using Illustrator) and I made this to share with the nice folks here at Affinity Forum. Thank you! I will use these together with the NEW set of Pattern Brushes from Wonderful FrankenToon! I am currently puddling around with some freebies for the Forum members but getting a little side tracked along the way! Ooops! Thanks,these remind me of FB status post backgrounds you can make when you make a status, I wish they would let ppl use those in Pages Posts too. Sorry, but how i can install it ? Go to the Swatches panel, click the small icon menu on the top right of the panel, select Import Palette... (as a Document, Application or System palette as you prefer) then select the .afpalette file from the dialog that will open. There's two files in the zip (excluding the JPG). 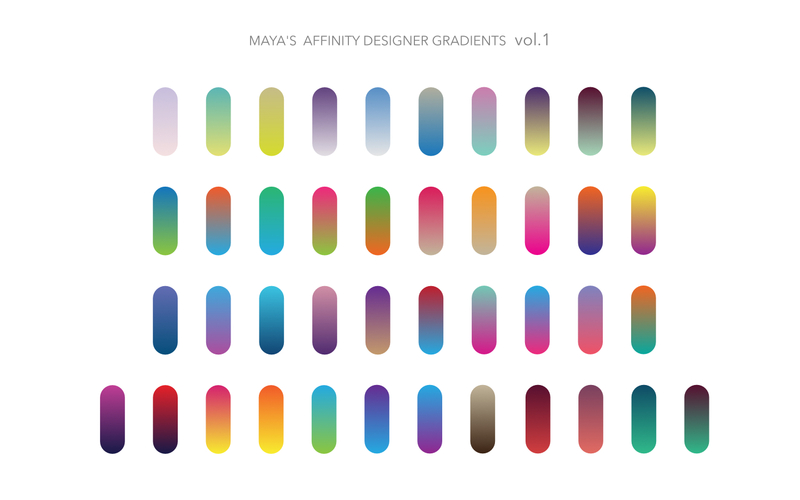 One - Maya's Gradients-vol1.afpalette - is the palette of gradient swatches which you must import from the Swatches panel clicking the small menu icon on the top right of the panel, selecting Import Palette... then choosing if you want to import it as a Document Palette (available only for the document where you are importing it), Application Palette (available in Affinity for all documents you open there) or System Palette (to make it available as a palette for the whole system - not sure if this last one is available on Windows). The other file - Maya-Gradients-vol-1.afdesign - is a regular .afdesign document which already has the gradient palette loaded/embedded as a Document Palette (as explained above) - you can ignore this one. The System Palette option is not available on Windows. thank you for sharing maya PS i love your name!